SUMMARY: Introduces readers to limerick poetry, what it is, and how to start writing limericks. Presents 26 original limerick-style poems. Each limerick has its own page and accompanying color illustration. REVIEW: I have taught limerick poetry at the middle school and elementary level, both as a teacher and as a librarian. In my experience, students love reading and sharing limericks though many students, particularly those whose first language is not English, struggle with the rhythm and syllable count in limericks. For students to successfully write limericks, it is imperative that they practice listening to the rhythm and tapping out the beat in limericks. The limericks in Something Sure Smells would be excellent examples to challenge students to begin their limericks without using the word "There." Puns, idioms, and figures of speech can also be difficult to teach at the elementary level, especially with English language learners. 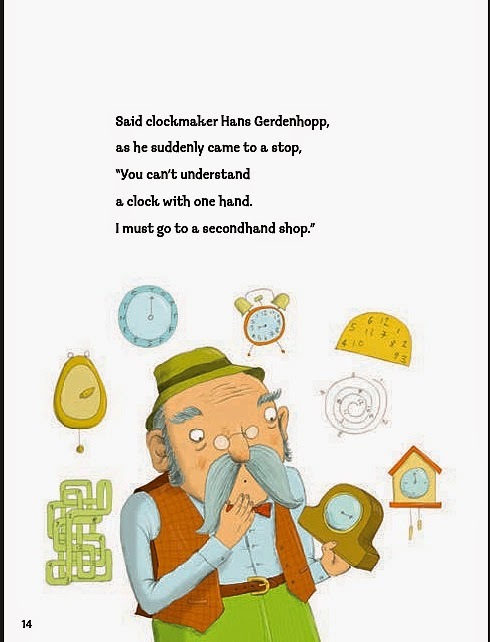 For classrooms with many ELLs, the puns, idioms, and figures of speech within the limericks could be a way to differentiate instruction for stronger readers while still using the same limericks. Students could be challenged to find the puns, idioms, and figures of speech or to write their own punny limericks. ENGLISH LANGUAGE ARTS: Use as an introduction to poetry, syllables, and rhythm/beat. The first page describes how to write a limerick, but it probably won't be very useful as a sole instructional guide. This is mainly a book of fun, illustrated limericks. Some of the limericks serve as examples of puns, idioms, and figures of speech. MUSIC: Students read the limericks aloud together and use percussion instruments to tap out the beat. OTHER: The poem "'Ahoy!' Said a pirate named MARRRRTY" (p. 15) would be fun each year on September 19, also known as International Talk Like A Pirate Day. THE BOTTOM LINE: This is a good addition to the many picture poetry books containing limericks. Libraries looking to add more limerick poetry to their collection will find much to love with this book. STATUS IN MY LIBRARY: On order for our middle school collection. Quality of limericks: 4/5--A couple of the limericks are head-scratchers, but the majority are silly and punny. Photos/illustrations: 5/5--Colorful drawings capture the silliness of the limericks. Every limerick has its own page and colorful illustration. Documentation of sources: n/a--All the poems here are original, so no bibliography is included or necessary. Front and back matter: 5/5--The entire book contains fun, colorful illustrations. Even the front and back flaps and the author/illustrator pages have fun, lively, colorful drawings. Also contains a "Further Reading" page which includes three recommended poetry books (one by Brian Cleary) and three limerick and poetry websites. Engrossing: 5/5--Very easy to read and understand. Perfect for teachers, browsers, and reluctant readers who enjoy silly poetry. Appeal to target audience: 5/5--Especially useful for Grades 4-6. Appropriate length: 5/5--Contains 26 short poems (only 5 lines each) spread over 32 pages. Readers can enjoy this book whether they read only a few limericks or the entire book. Hi-- Brian P. Cleary here. You mentioned you didn't understand the title. Can you elaborate? Hi, Brian! Wow, I am really excited that you found my little blog--I am very familiar with your picture books and how they make language and math concepts fun and easy for students to understand. I'm feeling a bit humbled right now to be communicating with you! As far as the title...I definitely think it will appeal to young readers' obsession with "stinky stuff." But the limericks in the book have loads of topics that will appeal to kids, not just stinky stuff. I'm curious as to why that one line was selected as the title as opposed to all the other lines in the limericks. Is there something special about that particular line? Was it a favorite limerick, or does it have a personal story to go along with it? Was it selected mainly to appeal to children's interest in all things stinky? I am really curious in your response--my students have asked me if I'm famous because I have met and talked with authors. They really are cute! Anyway, it will be great to share your insight with them when I booktalk Something Sure Smells with them. Anytime I have a story to go along with the booktalk, it helps foster great discussions and pique their interest in the author/book. Hi -- thanks for your compliments, and for reading my books. The title comes from the punchline of the limerick. It has to do with the double meaning of the word smells. We often think of the word "smells" as being synonymous with "stinks," but when you think of the nose, its function is literally to smell, to discern aromas and odors, as the eye is meant to see and the ear is meant to hear. So when the eye and the ear have a conversation, and the eye looks at the nose, it is saying "something sure smells around here," which sounds like a put down, but it's riffing on the fact that we colloquially use both "smells" and "stinks" nearly interchangeably. All that said, I wanted to name the book, "That Tasted a Little Bit Funny," but was overruled by the suits in marketing and sales!